With her manufacture and significance Anne Julie belongs among the top ranks of the world pipemaker scene. 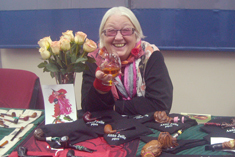 Together with Manduela Riger-Kusk (nicknamed Mandu), Roswitha Anderson (S&R Pipes), Sara Eltang, Nanna Ivarson and several other “Pipeladies” she enriches the manly domain of the pipemaking world for many years and one might say that with her significance she is the first lady in the world of the pipe. As wife of the legendary Poul Rasmussen, an important Danish pipemaker who worked together with Sixten Ivarsson, she was in everyday contact not only with pipemaking but also with the prestigious celebrities of the first-class Scandinavian school. After her husband passed away in 1967 she began to lead the company herself at the age of 27 and also personally learned the craft from Hans Johny Nielsen (currently more known under the name Former), a disciple of her poor husband. In him she found great aid and began with her own production. Anne Julie had employed such undoubtable stars as Jess Chonowitsch, Tom Eltang, Teddy Knudsen, Ulf Noltensmeier (Bang), P.H Vigen and Björn Bengtsson (“Björn of Sweden”). The production of Anne Julie is distinct and unique. She belongs among the Freehand makers who go their own way. Unlike the precise and perfect shapes, characteristic for the particular makers such as Takeo Arita, Rolando Negoita, or Michael Parks, the approach of Anne Julie is absolutely unequaled and with a downright and immediate identification of the maker. In one word it might be called “sculptural”. Her approach towards the pipemaking is in the meaning “the pipe bowl and stem must be compact”. Besides the typical shapes this is very often the identification sign when we see how the sculpter engraved the wood to continue into the stem and ending there or going further towards the end. Her shapes are often inspired by the world of nature and man. She succeeded in defining her own version of her very typical shape “Tulip”, “Lady's foot” and other variations of floral motives. She often works with silver applications which again she uses in a sculptural way. Her pipes can be identified by a red and white round mark. Most of the pipe smokers know the pipes made by Anne Julie from pictures or have seen them with their own eyes. Some are lucky enough to have her pipe in their collection. I had the opportunity to watch Anne Julie working on this pipe from start to finish. Thanks to this rare occasion I fully understood why her pipes amaze me so much. For three days I watched from the working table beside how the final shape of the pipe was slowly growing with light strokes of a cutter, taking away several layers in total harmony with the natural grain of the briar. It was more like watching a gardener grow a flower, watering it, watching it grow – in the end Anne's pipe grew into a lovely flower. I have to admit that some time ago for one of my pipes I used a quote by the sculptor Michelangelo regarding his statue of David, when he said: „The statue was already there in the stone and with my work I just set it free.“ Today I have to apologize for such a daring statement, but for this particular pipe made by Anne Julie that statement is true – I have seen it with my own eyes and confess that it is so. Anne Julie is undoubtedly a legend among the masters of the pipemaking craft, a living legend and at the same time an amazingly young lady, that shares happiness, smiles and help to all the people around her. First I wanted to meet her as a legend of the pipemaking craft, but today I must say that it is more important to me that I had a chance to get to know her as a human being, human in the very meaning of the word.